It’s been a while since I did a bee book-review. Partly this is down to lack of time and partly because I’ve been busy reading lots of other books, as I’ve been catching up with new ones by several of my favourite authors, like Alexander McCall Smith, Kate Mosse and Donna Tartt. Whilst looking in my local library, I was surprised to come across a bee book I hadn’t read! Alison Benjamin and Brian McCallum are a double-act who have also written the better known A world without bees and Keeping bees and making honey. 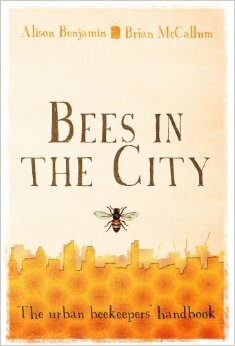 Bees in the City: The urban beekeepers’ handbook is a book of three parts. Part I, ‘The Urban Beekeeping Revolution’, introduces us to several different types of British urban beekeepers, including ‘The school beekeepers’, ‘The rehabilitation beekeepers’ and ‘The office beekeepers’. Our very own Ealing treasure John Chapple pops up as early as page 9! Their interviews give an insight into the wonderful variety of people keeping bees in cities – it certainly isn’t only old men with beards. The reasons people get into beekeeping vary too. Some individuals are interested in bees as pollinators, some in the honey, while schools find the bees can bring out the best in previously difficult pupils and companies often want hives to encourage team-building and to fit with their brand values and reputation. Part 2, ‘Making our urban environment more bee friendly’, focuses on the important question of whether our bees have enough to eat. John Chapple features in this part too, telling the authors how his honey yields are at a low compared with twenty years ago. He found two of his hives at Regents Park (he keeps several hives in different London locations) suffered dramatically when another beekeeper installed 40 hives nearby. Other urban beekeepers are more optimistic and there has been no definitive research produced yet into how many hives London can support. Alison and Brian say in this chapter “two thirds of London [is] given over to green spaces”, which I expect is a wild over-estimation. Part of the challenge is assessing how bee-friendly a green space is, in a rapidly changing city where front gardens are constantly being concreted over. A lawn is technically a “green space” but if kept cropped short and dandelion-free can be entirely useless for bees. This may be a good point to mention research recently published by Professor Dave Goulson and others in Science: Bee declines driven by combined stress from parasites, pesticides, and lack of flowers – thanks to honeymedic.wordpress.com for leaving me a comment about this. Interesting sentence from this on changes during the past 50 years – “Global honey bee stocks have increased while wild bees appear to have declined substantially, as evidenced by data for bumblebees and very scant data for other bee species.” Also, “there is evidence that high concentrations of domestic honey bee hives can displace wild bumblebees from their preferred foodplants and from whole areas if hive densities are sufficiently high“. Any keeper of honey bees who thinks they are ‘saving the bees’ is sadly mistaken. The European honey bee Apis mellifera is not endangered and its presence in large numbers could actually be a bad thing for local bumbles. Some hopeful projects are mentioned, like the north London River of Flowers, which is expanding to other cities, Brighton & Hove council’s planting of wild flowers along roadsides and the 4,000 semi-mature trees planted in the Olympic Park. An organisation called the Bee Guardian Foundation is mentioned as doing good work, but sadly I fear they may be a goner since the book was written, as their website no longer works and their Facebook page was last updated in 2013. 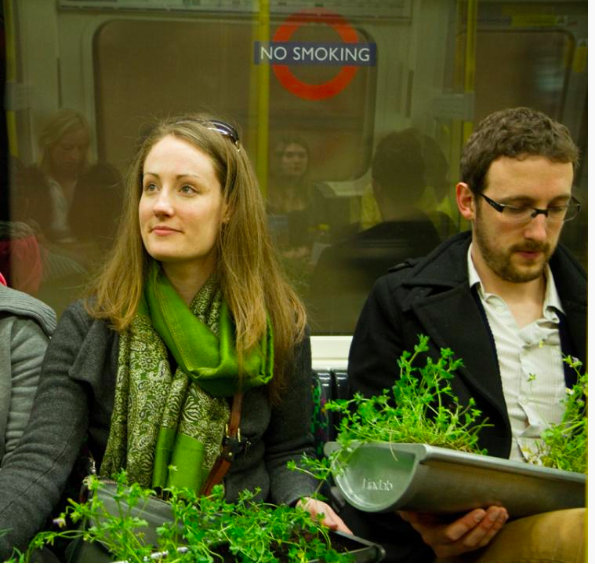 Finally ‘Part III, How you can become an urban beekeeper’, turns to the practicalities of keeping bees in urban areas. This is not so different to keeping bees in the countryside, but extra considerations like increased potential for disputes with neighbours and keeping hives in very restricted spaces are mentioned. The advice is sensible and I agree with their preferences for replacing old comb each spring and keeping good-tempered local bees rather than importing bees from abroad. Have you read any good bee books lately? This entry was posted in Urban beekeeping and tagged book-review, John Chapple. Bookmark the permalink. Thanks Emily, this sounds a great book! Us Urban Bee Keepers know, don’t we? Well, us Ealing beekeepers tried honeys from all over the world and our own local honey still came out top! Whoop whoop! Hi Veronica, thanks for your comment! Very happy for you that you’re allowed a hive and chickens now. A shame you’re not allowed two hives, as keeping two is much easier than keeping one, for instance if one hive goes queenless you can combine it with the other or take brood from it so the bees can make a new queen. Campaign for two hives per person! A book I should get. I hope they have a chapter on what do do when your city neighbors object. I have a friend that just added a hive to her city garden. It doesn’t cover everything a beekeeper needs to know, if you’re thinking about beginning beekeeping, but is more of a fun background book to read. Your friend could try a variety of tactics – for instance, putting a net or hedge close to the hive entrance to force them to fly up over people’s head height quickly. Sometimes people can have hives in their garden without their neighbours even realising. If your garden is quite small it’s best not to inspect when your neighbours are out in their gardens, just in case the bees get grumpy. In one of the books I read there was a funny story about someone whose neighbour claimed they had been stung by the bees in their garden hive. They were then able to inform their neighbour that the hive was actually empty! Some people will just assume that if they’ve been stung by an insect it must be a bee or struggle to tell the difference between a bee and a wasp. Thanks for this Emily. It is said that bees do very well in urban environments partly because there is a good mix of flowers and partly there are fewer pesticides than in the countryside – paradoxical! I am in the middle of reading “A buzz in the meadow”, Dave Goulson’s second book. It is not really a bee book but it does have quite a bit about bees in it. It is interesting but I have not found it as gripping as the first one, “A sting in the tale”. What do others think? Thanks Philip. You might be interested in London beekeeper Dale Gibson’s post on his trip to a bee conference in Berlin – http://www.apis.gb.com/bee-berlin-conference/ – Berlin is so bee-friendly that around 2,500 bee colonies are brought into Berlin each year by beekeepers from outside the city to take advantage of the Lime trees. I thought the same about Dave Goulson’s second, but still I did enjoy it.